The adversary sabotage and reconnaissance groups have become increasingly active. The Russia-backed militants 51 times attacked the positions of ATO troops in Donbas in the past 24 hours. The enemy intensified attacks in the Mariupol sector, which saw 35 barrages, ATO headquarters report. The militants launched attacks near the villages of Vodiane, Hnutove, and Shyrokyne, said ATO the press center. The terrorists fired a ZU-23 AD anti-aircraft system near Novotroyitske. Donbas militants used small arms, heavy machine guns, rocket-propelled grenades and 82mm mortars to shell Ukrainian positions near Avdiyivka. The enemy attacked ATO troops near Novoselivka Druha in the afternoon, having fired 23 mines from the banned 120mm mortars. The occupiers were also active near the Svitlodarsk bridgehead, where the Ukrainian positions came under fire from small arms, rocket-propelled grenades and heavy machine guns. The adversary sabotage and reconnaissance groups have become increasingly active recently. Groups consisting of 10 enemy fighters attempting to penetrate into the rear were spotted in ten vicinity of Maryinka and near Novotroyitske. 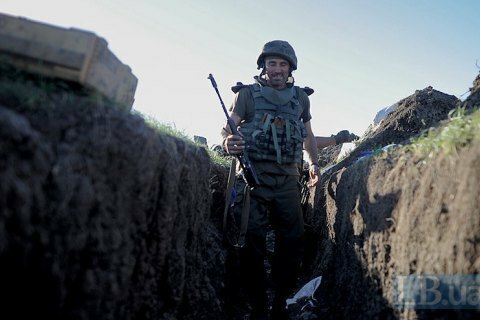 It was quiet in the Luhansk sector in the last day.